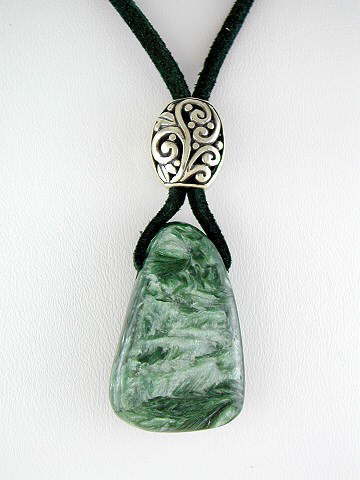 'A' Grade Seraphinite freeform cabochon suspended on a dark green suede thong and finished with a substantial 925 sterling silver filigree bead (hook and loop fastening). Seraphinite (also known as Clinochlore) gets its vibrant deep green colour from Chlorite – considered to be one of the Master Healing stones - and has feathery, silvery iridescent markings. It comes from a mine in the Lake Baikal region of Russia. This is a most effective stone for cellular regeneration and when used in a treatment session can cause a flush of pure healing energy to be released. It acts as a trigger, causing old patterns of disease or imbalance to start to dissolve away allowing for new patterns to be created, and, therefore, letting a client hold a piece while they talk to you can prove beneficial. It is the premier healing stone of this age. It is the crystal most suited to bringing the physical body into line with the Light body. While the beautiful green shade is perfect for the Heart chakra, it can be used on any chakra to enhance and harmonize energy.